Thriveabetes; What is it? Why do I need it? My children have been back to school for almost two full weeks now and since their first day back I've been spending a couple of hours most days planning Thriveabetes 2018. A month ago, at our fundraiser, I was asked to explain what Thriveabetes is, why people with diabetes need it and why I was asking people to give money to it. After my nerve wrecking speech, several people commented on how they had no idea that living with diabetes was so involved and required so much work. Why I keep forgetting this when I talk about my diabetes I'll never know! This post is to explain to people who don't have diabetes, what living with type 1 diabetes is actually like, to explain what our conference does for people with diabetes, why I'm passionate about it and why I need it. What is Thriveabetes? And why do people with diabetes need it? To answer these questions I have to, first, take you on a little journey. My journey. I was diagnosed with type 1 diabetes 24 years ago as a young adult and It changed my entire life. I'd like to be able to say that living with type 1 becomes easier but it doesn't - it becomes habit. I woke up this morning, a little groggy because my glucose alarm went off during the night telling that my levels were a little high. So I got up, checked them on my meter, worked out a correction dose of insulin, took it and went back to sleep. Before breakfast, I checked my levels again; they were in target, so I took my insulin for my regular weekend breakfast of tea and toast also known as 40g of carbs and then ate it. Two hours later with kids and car packed to travel across Ireland, I checked my levels again to see how close I came to getting it right. The answer was; not in target range, but close enough. As I visited with my mother and family, I wondered what lunch was going to involve and when it was likely happen. It ended up being a sandwich at a Spar. I checked my glucose levels again. They were a little above my target, so I had to work out a correction dose of insulin plus working out an educated guess of how many grams of carbs were in this particular sandwich. Then I eat. My day, as with all other days, continued like this. I do all of this out of habit. The numbers are very seldom perfect. But I get on with "close enough". Now imagine, that the person with diabetes isn't you, but your child. So on top of all of those daily diabetes tasks that I do, you now have the added worry of “if I don't do this “close enough” my child is going to get sick. Again!”. This kind of anxiety and stress goes on 24 hours a day, 7 days a week, etc. Diabetes NEVER takes time off. Ever. This is why Thriveabetes is needed! Thriveabetes is a place where you can relieve some of that stress and anxiety. The power and comfort of being in a room with so many people with diabetes, learning so much about managing daily life with it and knowing that every single person in that room knows diabetes like I do, lightens that load. There is no other place where we can get that. It's a day that is organised completely by us; people with type 1 diabetes. We are all volunteers who are dedicated to and passionate about bring people with type 1 diabetes together to share what we deal with every day and to learn from world class speakers. And that is Thriveabetes. And that is why I need it! 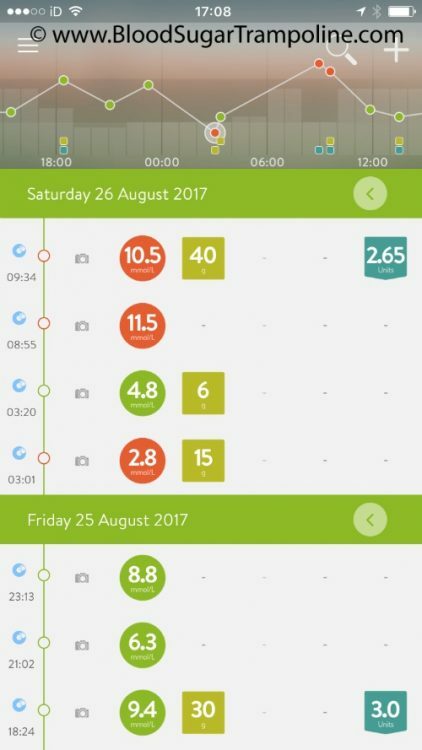 I've been using a continuous glucose monitor (CGM) since November 2015 and it has made a huge difference in my diabetes management. It has narrowed the glucose swings so much and it has been a huge relief in my anxiety relating to trying to avoid hypos. And I have worn it 24/7 since I got it. Last Friday, I had an MRI on my stupid 83 year old hip (another story) and I had to take my sensor off. So I decided to go the whole weekend cgm-free. I thought it would be nice to have a break from the alarms and just see how I got on. I felt completely blind! 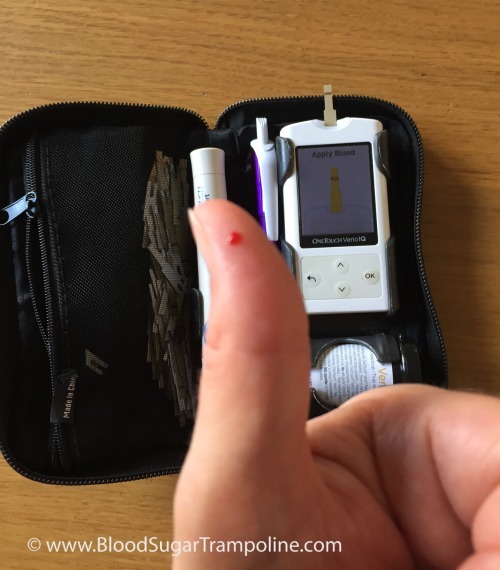 I had no idea what my glucose levels were between finger prick checking and it was a huge loss of information. I felt I was making decisions with my insulin without all of the information. That evening, I went to bed with a respectable glucose 8.8 mmols/L to be woken at 3am by perspiration steaming off my body of a glucose level of 2.8 mmol/L. I tried not to consume the entire kitchen and lay across the couch willing cold air to descend on me and cool me down. Twenty minutes later, with glucose levels at 4.8 mmols/L and probably shooting for the sky in a rebound high, I had recovered enough to go back to bed. I woke with a glucose level of 11.5 mmols/L which was lower than I expected but still too high. At least, I was spared the high alarm during the rest of the night. I can't believe that I used to think that I was doing fine on the information provided by 7 finger prick glucose checks per day! Using a cgm has taught me so much about how to manage my diabetes, it has taught me about creating more effective insulin doses and it has given me more power over my life with type 1 diabetes. This piece of technology is really valuable for people with type 1 diabetes. However, I do realise that it isn't something that everybody would want or can get. I believe that availability will change in the near future though as more and more health care professionals realise its value in providing information beyond HbA1c’s also. It's summer in Ireland. But summer in Ireland means wearing a rain jacket a lot of the time or a cardi. However, the weather has warmed up enough recently and has been a bit drier to go out in short sleeves. This feels a little uncomfortable for me. Why? I wear a gadget thingy on the side of my upper arm. It looks odd and in short sleeves it’s hard to miss. Especially, when I've been wearing it for a couple of weeks when I've had to put extra tape on it to keep it stuck on and it looks a bit “ick”. It's a continuous glucose monitor and it measures my blood glucose levels every five minutes and transmits this information to a receiver screen. This device also alarms when my glucose levels are too high or too low, giving valuable information that helps me improve my diabetes management. When I first started wearing my CGM two years ago, I was very self conscious of it and would actually wear a cardigan to collect the kids from school just to avoid talking about it. Everybody I met commented on it. These days, I’m less aware and forget it’s there most of the time. Until I’m walking around the grocery and I suddenly sense that someone is looking at me. Then I do become slightly more conscious of it. But it’s difficult not too because I can feel the looks. I got into a taxi last year and the driver asked me if it was a bomb? So I’m always wondering if that’s what other people are thinking, especially going through airport security. Most people don’t say anything though. The strangers don't approach me they just look. I can live with the looks now and I’ve worn short sleeves more that I did last year. I've gotten over how self conscious I was of it at the beginning. Because it's fricking awesome in what it does for me and my type 1 diabetes. And maybe some day it will be the reason that another person with diabetes comes up to me and says “Hi”.